They talk about the Storage Networking World (SNW) in Dallas, TX. The group discusses the changing storage area, how hard drives are not going away anytime soon, and more. All while tornadoes pass right above them! 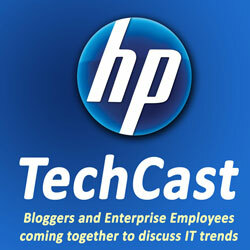 HP TechCast is a podcast where Enterprise professionals meet with Bloggers to talk about trends in IT. The bloggers have a chance to get questions answered and learn a little more about the new technologies coming out.